Pequod is…I can’t entirely quantify Pequod other than to tell you that it got me (momentarily) past my pixel-art-indie-game fatigue and flipped some sort of switch in my brain that dumped the same dopamine rush I got the first time I saw a Water Bear (tardigrade) in a drop of pond water. It’s supremely weird but fascinating and makes me feel both slightly uncomfortable in my lizard brain and joyous in another part. 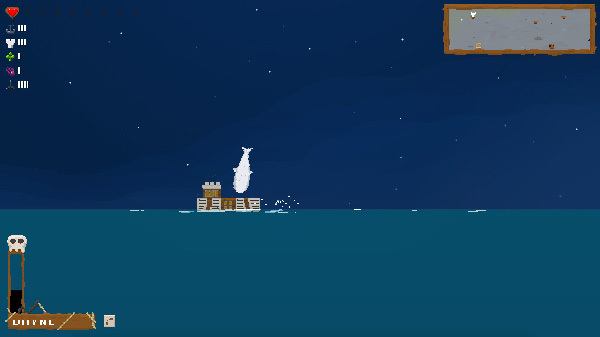 I played it for an hour the day that In the Heart of the Sea came out and felt really good about myself. Whale hunting is not cool, man. Crushing a flying sailing ship with a whale with a laser shooting out of its face, on the other hand, is super cool. There’s only one thing wrong with Pequod’s weirdness is this: it’s pay what you want. I hate that. I bought it for $10 and then wrote an article about it and have been obsessing about whether I paid too much or I underpaid and somehow offended the BearMancer by not paying enough for his game that he worked hard to create that gives me the same pleasure/grossed out feeling as holding a giant millipede. Either way, thanks, Pequod.